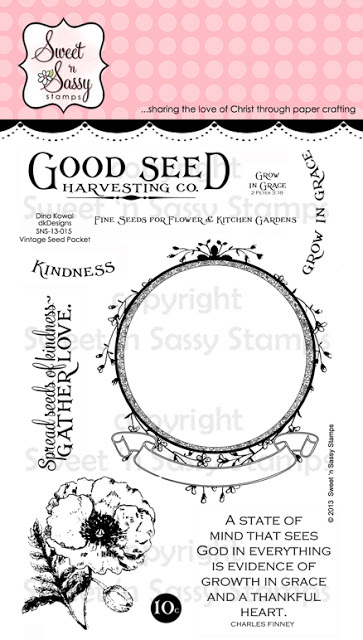 Dina Kowal Creative: dkdesigns new release: Vintage Seed Packet! 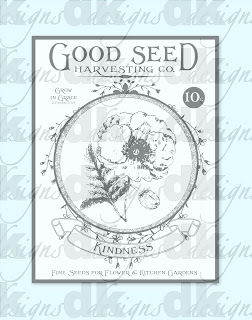 dkdesigns new release: Vintage Seed Packet! So excited to share this new dkdesigns set now available from Sweet 'n Sassy Stamps! It's been a few months since my last release, and I'm loving all the possibilities of this set. Meet Vintage Seed Packet! Like Vintage Postcard, this set is interactive, and each piece can be used on its own, or in a wide variety of combinations. It's great for collage stamping too. The flower and sentiment at the bottom fit in the circular opening... that opening can also be used for a shaker opening, or can be mortise-masked and stamped with images from other sets - lots of possibilities there! 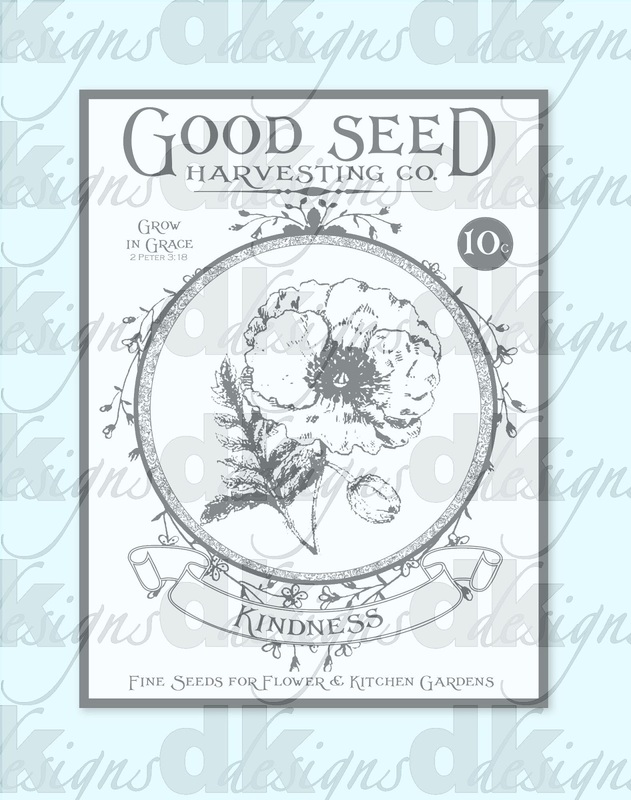 Here's one concept of how the stamps can go together to look like an actual vintage seed packet. For my card I used the vintage botanical illustration, and created a background with it. After stamping the flowers, I stenciled the diamond pattern with a Polychromos pencil, then colored the rest of the panel with Inktense pencils. There's a tutorial for this technique HERE. Love the fonts in this sentiment! Click below for more samples using my set. Thanks for visiting me!! Love your stamp set and your card! I popped over to check out the technique and am in love with it! New to me and a must try soon! Thank you so much for linking it and making the informative video! Very pretty! I like how you stenciled the diamond pattern. such a lovely card Dina and I love the cool technique you used! Wow! This card is amazing! Love the coloring and background work. Dina, I love how you created the background. I do not have enough imagination to have thought of this! I have a hard time taking just one stamp from a set and using it to create something original. Thanks for the lovely inspiration! Beautiful! TFS God bless!! Wow Dina OUTSTANDING this card is, I love the tec. you used from your wonderful video.,thanks for sharing all this creativity, have a great day..
How beautiful! I love the mix of fonts that you used! Love this set and how you have used it here- so beautiful! I need that set and I need to try that pencil resist technique. The cards you have showcased recently are simply gorgeous! Love how you did the background for this card!! Wow! Absolutely amazing. Your attention to detail is amazing. I favor CAS cards and this is definitely a LO I would use. Thanks for the tutorial. I am going to give this technique a try. How pretty! Thanks for including the tutorial for the technique - will have to try this! Wow! Your coloring is amazing! I wish I could color like that. I really like the kraft card with this. Beautiful card. Very nice vintage looking set Dina! I love the fonts too. Lovely card, cool background, inspiring creativity! Gorgeous, rich colors! Lovely design, Dina. This is a great set and a beautiful card! I really the sentiments in this set, and the frame! Beautiful card Dina. I love how you stamped the images with the diamond background. Pretty colors. Ahhhhhhhhhhhhhhhhh .... I did not realize this set is your design Dina. 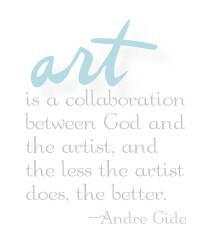 No wonder I truly adore it. Beautiful blossom, and very creative design for the other components as well! I like how you used this new stamp set with flower so CAS just beautiful. I like the technique you used,awesome. Thanks for sharing. Dina, this is a beautiful stamp set - a must for any flower lover! Love your card - the poppies are beautiful on your background! So pretty! And what a great technique. It looks so fabulous. At first, I thought you had used some nice designer paper but after reading realized you had made it...how creative...beautiful! Beautiful card, what a great stamp set. Congrats! 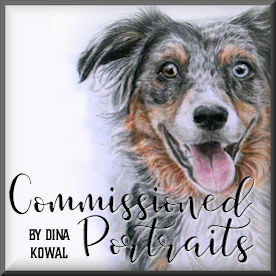 Awesome new set Dina! Love your unique style! This card is a stunner! Love those creative techniques you used! Your card is gorgeous, love those beautiful colors! Your card and that stamp- gorgeous!!! beautiful!! love your handmade designer paper!! Wow Dina! This is gorgeous! I have never tried this technique before, but I definitely think I must :) Thanks for the link! Beautiful work with this stamp set. WOW! Didn't realize when I commented before that you designed this set-great job. This set is so beautiful and so as your card! You rock, Dina! !